Our mission is to provide capital and advisory services to foster positive community development impacts in distressed neighborhoods by aligning the needs of our borrowers and investors. The LDC is a nonprofit 501 (c) (3) public benefit corporation. It is licensed by the Department of Business Oversight of the State of California under the commercial finance lender statutes (CFL). The LDC holds the designation of Community Development Financial Institution under the U.S. Department of Treasury and California Department of Insurance. This status allows the LDC the opportunity to provide regulatory credit for community reinvestment act purposes to financial institutions and insurance companies. The LDC offers access to capital and community development investments to its clients - both borrowers and investors. Our variety of borrowers ranges from start up, emerging, dynamic mid-size businesses and nor profit organizations while our investors includes commercial banks, community development loan funds, socially responsible investors, government programs and faith based organizations. We couple our delivery of capital with high-quality advisory services to provide market-driven priced capital and the best financial solutions available in the markets we serve. Our demonstrated ability to merge capital access, profitable community development investment and financial advisory services to deliver impactful and comprehensive solutions to the most complex community development financing problems in the low income and distressed neighborhoods makes the LDC a much sought after partner. LDC is a not for profit, public benefit corporation organized to promote general and social welfare. It is exempt from income taxes under Section 501(C) (3) of the Internal Revenue Code and Section 23701 (f) of the California Revenue and Taxation Code. The organization is governed by a nine (9) member board of directors consisting of business professionals with backgrounds in banking, finance, real estate, law and economic development. The LDC is located just west of the Downtown Central Business District at 1010 Wilshire Boulevard, Suite 807, Los Angeles, California 90017. The office is sited in the Los Angeles State Enterprise Zone where its staff occupies 1,400 square feet of space and maintains record storage at an offsite facility. In 1980, visionary Mayor Tom Bradley launched the Local Development Corporation to serve the neighborhoods in Los Angeles that suffered from redlining and disinvestment. The LDC operated as part of the Mayor's Office for the next 15 years and with the election of Mayor Richard J. Riordan it became an integral part of the LA Business Team. In 1995, under the leadership of Mayor Riordan the organization's first chief executive officer was hired to develop and sustain the most innovative community development capital access strategy to serve the distressed neighborhoods of Los Angeles. 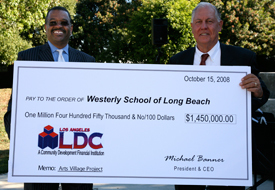 Since its inception, the LDC has facilitated or funded over $200,000,000 of financing for businesses and real estate development projects in distressed communities of the City of Los Angeles.